My great-grandmother Maude McClelland's rhubarb, planted more than 100 years ago at McClelland's Beach, Spirit Lake, Iowa, survives today on our place, after a handful of rhizomes were rescued many years ago when my grandmother died, leaving her mother's garden to fate. 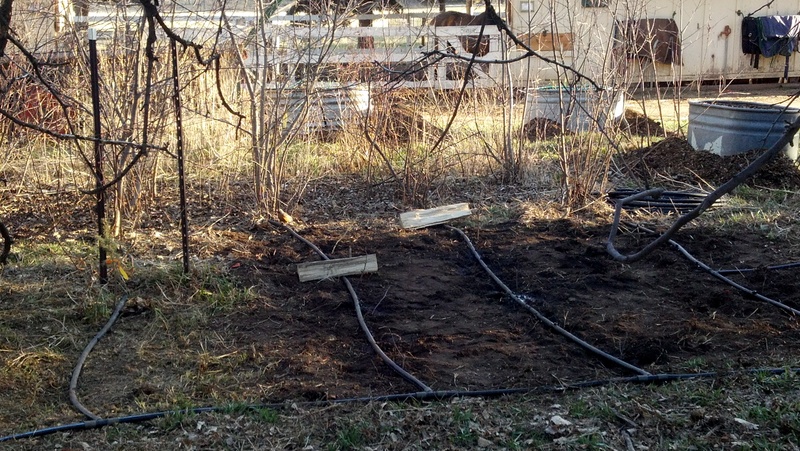 We split the rhizomes today and replanted Grandang's rhubarb in the garden nearest to the overnight horse pens. I'm taking the robin in the patch as a good omen. The little bird loved the worms in the rich dirt, which was created by adding compost from our manure pile years ago. This rhubarb is lacier than what I see for sale in Colorado, and makes superb wine with wonderful blush and a hint of spice. Stay tuned as Grandang's rhubarb grows! P.S. For dependable recipes and techniques, I prefer "The Art of Making Wine". You might also enjoy Pressing On: Ye Olde Cider or this Pillsbury recipe for Strawberry-Rhubarb Mini Pie. This little horse is another reminder that the outside of a horse is good for the inside of a child. Click on the photo to read the complete story. Read also: A mini-horse in a restaurant? You gotta love it - no snow in the Winter, but Spring? Yes. You might also enjoy our October snow storm photo album. This deer family bedded down on our property this afternoon. 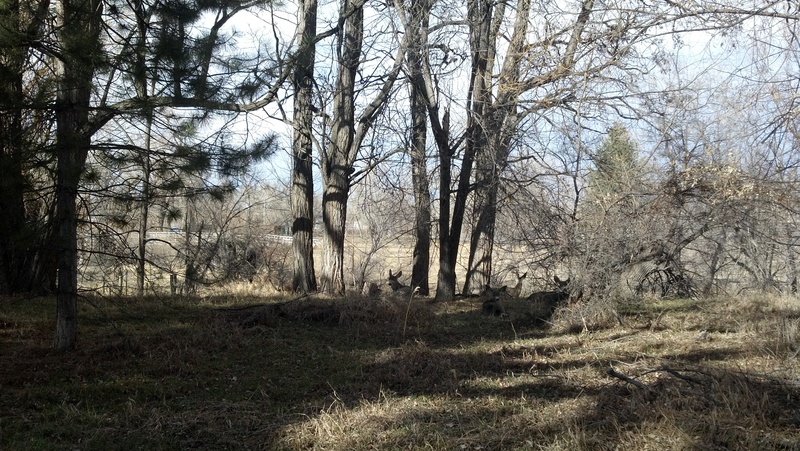 How many deer can you find? Visit our wildlife photo album. 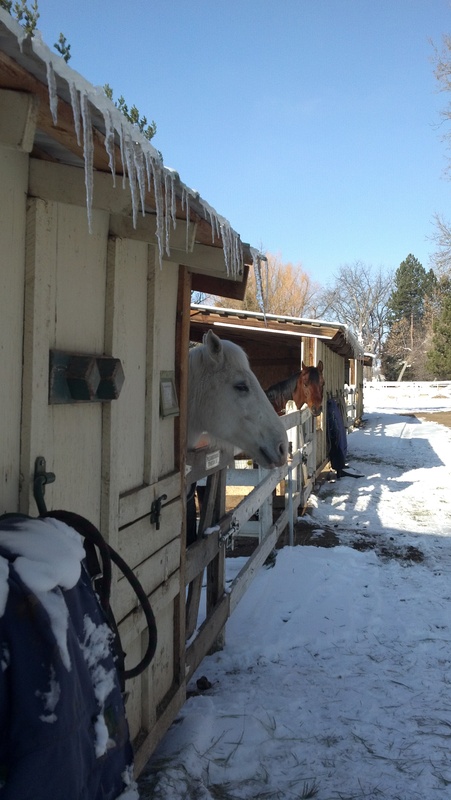 "Several horses appeared to be underfed and there was no water available to the entire herd." This might be an interesting meet-and-greet. We could test them all on the Code of the West. Larimer County is showcasing its finalists for the new development director position, which replaces the planning director job. The public session takes place Monday, March 11, 6:30-8 p.m., first floor hearing room, Larimer County Courthouse Offices, 200 W. Oak St., Fort Collins. Click on the link above for the full Loveland Reporter Herald story on Larimer County's search for a new development director. Winters are particularly tough on laminitic horses. It seems like everything is more sensitive, their legs, their feet, their bodies. Bonnie, now about 28 or 29 years old, has worn front shoes ever since she foundered in 2005. We tried pulling shoes during the snow and ice season, but Bonnie always became sore-footed. I think for Bonnie, the soreness comes from a combination of sensitive feet, old-age arthritis, and whatever damage laminitis has done. Bonnie needed the support of shoes. Lately however, she seemed consistently tender. I wondered if her feet were weary of enclosure in metal shoes. I worried that she might also be developing contracted heels, and that the metal shoe was not allowing the foot to pump properly, encouraging circulation. I visited the Soft-Ride website many months ago, but balked at the approximately $300 it would cost to fit Bonnie with two of the boots, which though they come with a “normal” orthotic insert for $200, would probably work better for her with the special laminitic insert for another $100. Soft-Ride had great measuring instructions, but the process was still difficult, not knowing if I was following instructions correctly. A measuring video would have been helpful. In hindsight, I should have commandeered an assistant for the measuring part. Also, I needed a stubby pencil to get around the back of her hooves, and of course, all I had on me was a normal-length felt pen. I decided to commit to the order on a Thursday night, and added two-day FedEx ground delivery. What a waste that expense was. Monday would have been understandable, but the boots did not arrive until the following Tuesday. I suppose I should look into a FedEx refund. After a pre-fit with Bonnie still wearing her shoes, I guesstimated that the boots would fit correctly on her bare feet. My goal is to keep Bonnie barefooted, and perhaps, if the boots improve her overall foot health, ever so gradually transition Bonnie to a mostly-barefooted life. So, Gregg pulled her shoes. 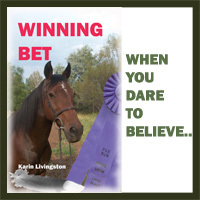 I peeled back the heel of the first boot, held my breath, and slipped Bonnie’s foot into it. Cinderella could not have done better with the glass slipper. The boot, a 7 Long, fit! I slipped her other foot into a boot, loosely closed the industrial strength double velcro fasteners, and Gregg walked Bonnie a few steps just so her feet could push down more deeply into the boot. Bonnie looked tolerant, but I couldn’t tell how well the boots worked. I re-tightened the fasteners, and Gregg walked Bonnie around the staging area. All I can say is, I should have put these boots on Bonnie when she first foundered! (Did Soft-Ride even exist then?) Bonnie looked wonderful. No more “walking on eggshells”! Our elderly, lame sweetie took full strides, flexing properly through the toe, heel, and foreleg. Backgrounder: In the acute phase of Bonnie’s first founder attack, we bought construction Styrofoam, traced around her feet, and wrapped the Styrofoam to her hooves with duct tape. This was cheap, but the true cost was time and sticky mess. Those Styrofoam booties had to be changed about every 24 hours because they went flat and the duct tape wore out, leaving tape residue on Bonnie’s leg hair and hooves. Like many horses in pain, Bonnie often displayed wrinkled nostrils, pursed lips, and a dull attitude. I do feed Bonnie our dried willow to make her more comfortable, but even though I have seen no side effects, I don't want to overdo it. It would be nice if she didn't have to rely on pain meds, just a nice natural, health-promoting solution. You'll be glad to know that when I returned Bonnie to her stall, she stuck her head over the wall and looked around bright-eyed. I could swear she was grinning.